Home Breakage Combs and Brushes Natural Hair Relaxed/Texlaxed Hair Studies Case Study || "Tangle-Teezer-Like" Tool and Breakage? Case Study || "Tangle-Teezer-Like" Tool and Breakage? 1) It gives possible confirmation to those who jumped on the "Tangle Teezer" bandwagon and noticed an increase in breakage and split ends thereafter. 2) And, for my own hair care practices, it makes me think twice about using the "Tangle Teezer" on my flat-ironed hair. (You see, I figured the problem with the tool that most people were experiencing was due to using it on textured hair. I thought it okay to use the tool on straight hair ... until now.) Contrary to what I initially guessed, the study was performed on patients who were not afro-textured but who had naturally straight/wavy hair. Even on straight hair, this tool may present a problem!?! to change their combing habits (which involved using the tool on hair that had not been lubricated with conditioner or oil). About trichorrhexis nodosa - "The essential abnormality of trichorrhexis nodosa is the formation of nodes along the hair shaft through which breakage readily occurs (Source)." It's not just certain tools. I will say that whenever you try a new tool you should inspect it up close first, to make sure there are no abnormalities that will contribute to hair loss. These include but are not limited to roughly manufactured tools, warped or broken bristles or teeth, ridges on poorly molded hair tools. All these things facilitate and accelerate hair damage. When you tool-shop, go with the mindset that your tools should look and feel like someone hand carved and smoothed them. That being said, I learned as a cosmetologist that everything we do damages our hair some. Even shampooing, running a hand through it. 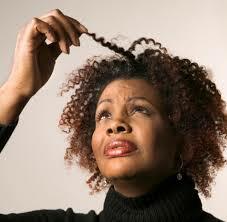 It is what we do to minimize damage that keeps our hair healthy. The overuse of tools and the overmanipulation of one's hair whether with a tool or manually, will cause damage. Groom your hair as infrequently as possible, don't constantly play in it; condition and moisturize as needed to help make what you do less damaging. And, leaving your hair until you have to detangle it is the other extreme, because you have to do more work to groom it. The article did a good job of raising awareness about the problem of tool trauma. i always knew those things were bad.